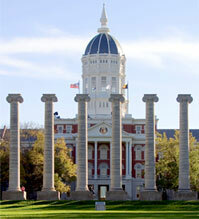 Mizzou Giving Day is the University of Missouri’s daylong campaign to raise support from MU alumni and friends. This year's Giving Day will be March 14-15. COLUMBIA, Mo. – This year’s Mizzou Giving Day will be held in the 24-hour period from 12 p.m. Wednesday, March 14, to 12 p.m. Thursday, March 15. Mizzou Giving Day is the University of Missouri’s daylong campaign to raise support from MU alumni and friends. The campaign hopes to inspire the entire university community—alumni, friends, faculty, staff and parents—to support any school, college, program or area at the university. Mizzou Giving Day is a comprehensive fundraising effort, striving to raise support for all areas of the university. During the first annual Mizzou Giving Day, in 2017, alumni and friends made more than 3,500 gifts totaling more than $8.3 million for schools, colleges and programs across campus. Thanks to challenge funds, this year’s Mizzou Giving Day will encourage friendly competition among schools, colleges and units. The five schools, colleges and units that raise the most money and receive the highest number of gifts will win bonus funds. Additional challenge gifts also will fund five social media challenges. The winner of each social media challenge will receive prize money to designate to the school, college or program of their choice. Donors can visit givingday.missouri.edu to make donations to any school, college, unit or program they wish. Donors also can visit that link throughout Mizzou Giving Day for updates about fundraising totals for each school and college as well as the total amount of money raised for the university. Supporters also can give to Mizzou by calling (866) 267-7568. Donors and the Mizzou community can share in celebrating Mizzou Giving Day on social media with #MizzouGivingDay on Facebook, Twitter and Instagram. New this year, the Mizzou Alumni Association Scholarship challenge will raise money for student scholarships. Every dollar given online to the Mizzou Alumni Association Scholarship Challenge between noon on Wednesday and noon Thursday will be matched up to $2,500 per participating local chapter or affinity organization. Student success Providing Mizzou students access to world-class learning opportunities will ensure they thrive on campus and throughout their lives.